The Radio Flyer® All-Terrain Classic Red Wagon mimics the original Little Red Wagon with the exception of the tires. Made to go mudding, the body has deep cargo space with large air-filled tires. The handle is extra long, so little ones' toes do nott get caught under the wheels when pulling. The sides are extra tall to keep precious cargo from spilling out. The wagon has a controlled radius turning pivot to keep the wagon on all four wheels when turning. 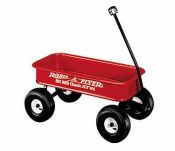 Wagon Dimensions: 36" x 17 1/2" x 6"